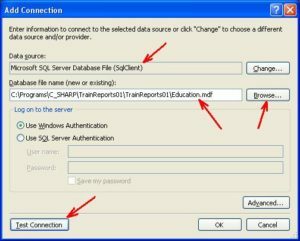 This example demonstrates the generation of a report based on data that are located in a local database such as Microsoft SQL Server. 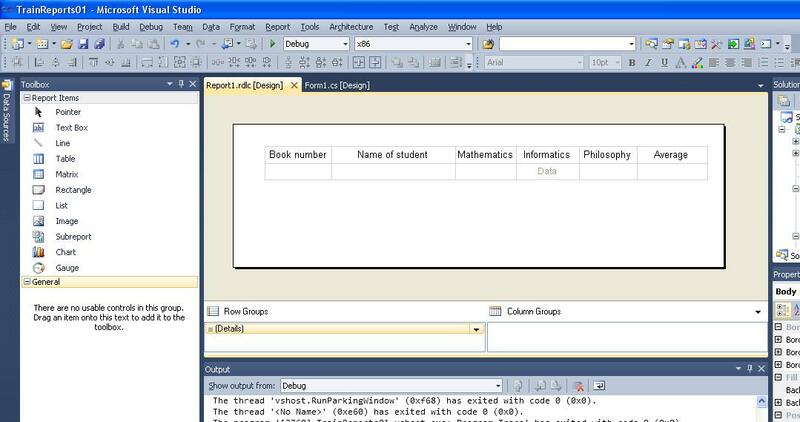 The database is implemented in the Education.mdf file. 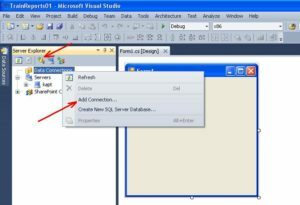 In this example, you can learn how to create your own reports, which are formed on the basis of data that are intended for use under the control of Microsoft SQL Server DBMS. 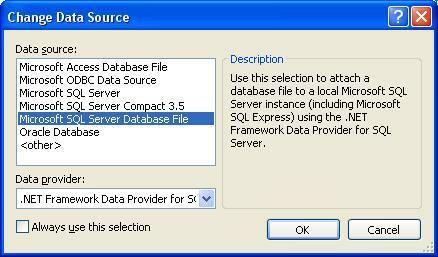 Given a database, which is designed for use under the control of Microsoft SQL Server DBMS. 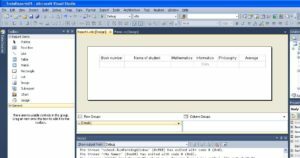 Two tables with the names Student and Session are realized in database. The tables are related between themselves by a certain field. The structure of the Student table. The structure of the Session table. The tables are related to each other by the ID_Book field (the record book number). The report should be displayed in a separate form. To create a report, you need to create Views. 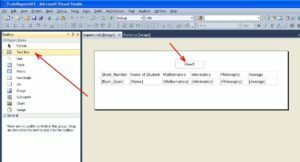 A view is a simple query to a database in the SQL language. In the view, a resulting table is created with the selected data. Based on this View, a report will be created. In this case, download the archive with the ready (previously prepared) database file using this link. The archive contains Education.mdf and Education.ldf files. It is recommended that you unpack these files into the folder where the application you are developing will be located. 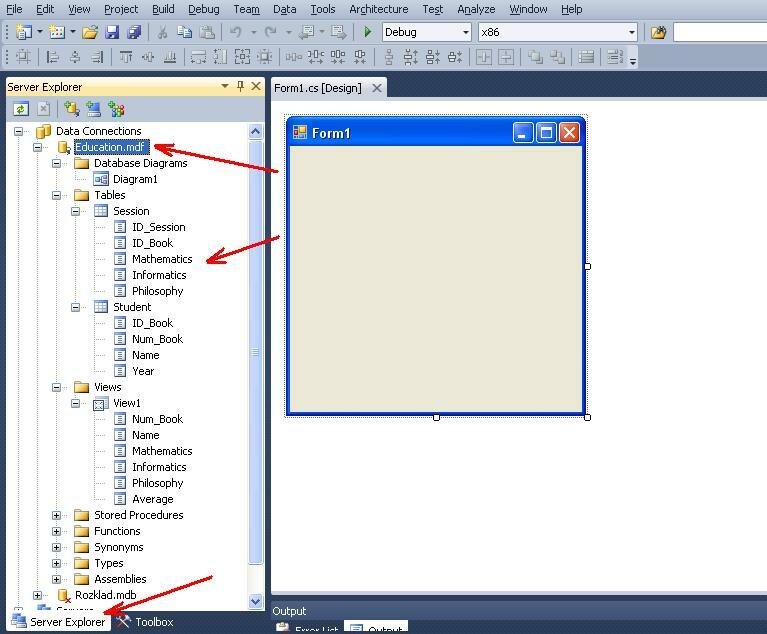 To use the database “Education.mdf” you need to connect it to the project in the standard way. 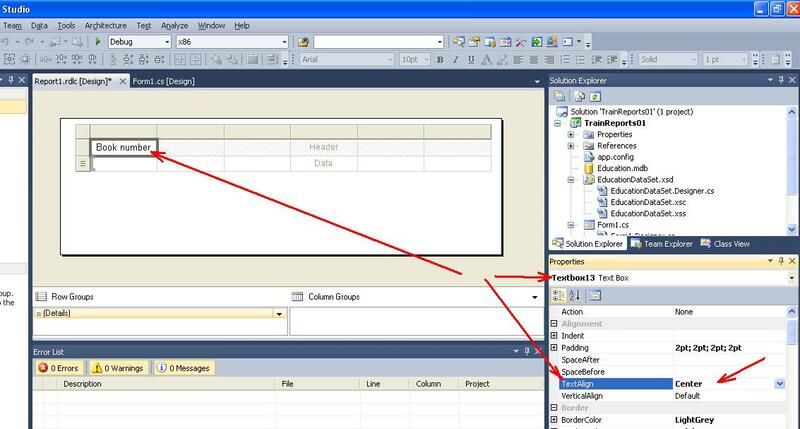 To connect the database file to the project, use the “Add Connection …” command from the context menu, which is called in the Data Connections list (Figure 1). 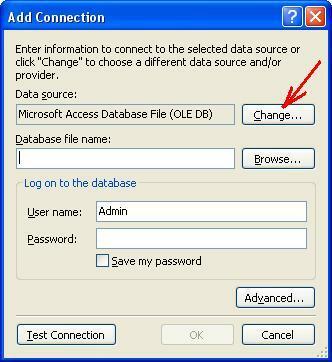 Another way – select the command “Connect to Database” (see Figure 1). 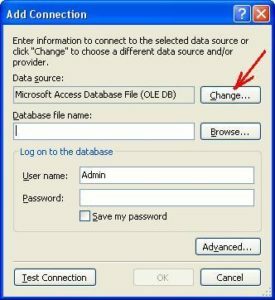 In the next window “Add Connection” in the “Database file name” field, specify the path to the database file as shown in Figure 4 (the ‘Browse…’ button). 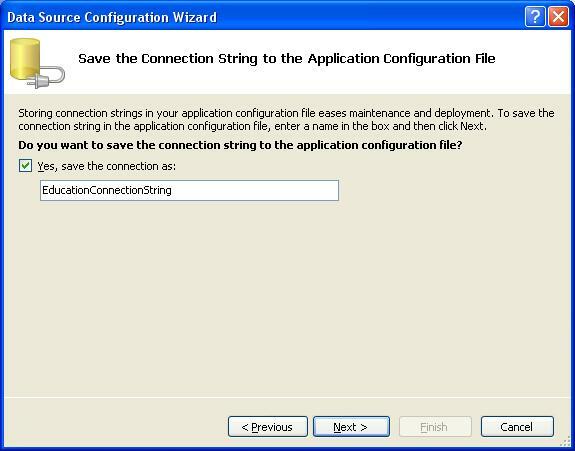 If done correctly, the “Add Connection” window can take the form shown in Figure 4. Using the “Test Connection” button, you can test the connection to the database. 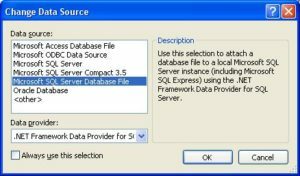 To fix the selection of the database, select OK.
After completing the steps, tools Server Explorer window will look as shown in Figure 5. The window displays a detailed view of the Education.mdf database. “View1” view, which contains the display of some table fields as well as the calculated field “Average”. In accordance with the condition of the task, the report should be displayed in a separate form. Therefore, the main form of the application has the form as shown in Figure 6. As you can see from the figure, the form contains only one Button control named button1. After clicking on the “Show Report” button, a report in another form will be displayed. in the Form1 control (main form), the property Text = “Report Viewer”. In the Microsoft Visual Studio system, each report corresponds to a file that has the extension “* .rdlc”. This file contains the data that is generated in the report. 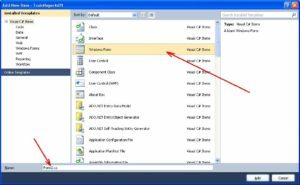 To create a file in Microsoft Visual Studio, you need to call the Add New Item command from the Project menu (see Figure 7). As a result, the “Add New Item …” window opens, in which you select the Report template (Figure 8) and specify a name Report1.rdlc for the report file (by default). 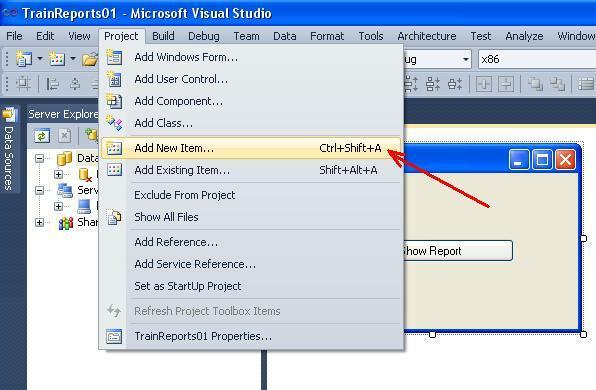 After confirming the selection (the Add button), the Microsoft Visual Studio window will appear as shown in Figure 9. 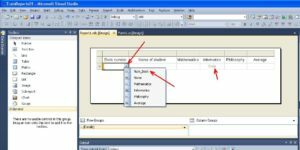 Before designing a report, you need to activate the “Report1.rdlc [Design]” file window. To design the elements of report, use the ToolBox panel (Figure 10). 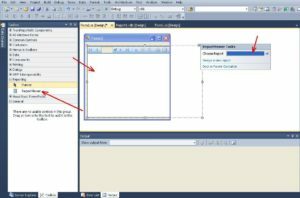 The Microsoft Visual Studio system offers a number of controls that you can use to develop a report. With these controls, you can design the appearance (view) of a variety of reports. the control of type Gauge. Displays a value, field, or expression as a linear or radial relationship. Without going into the features of the use of each control, we use the Table control to solve our problem. This control displays data in the grid, which have a fixed number of columns and a variable number of rows. To place a Table type control on a report layout, you need to select it (using mouse) in the Toolbox and click in the report area. 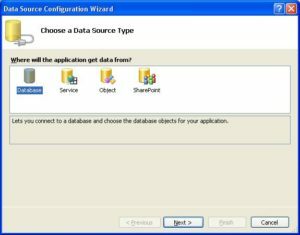 This will load the Data Source Configuration Wizard. 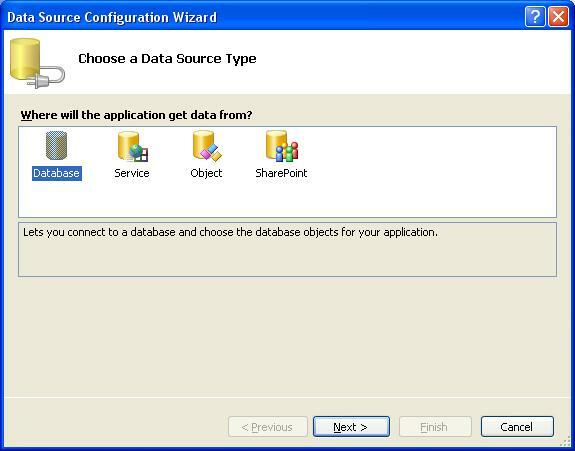 In the first window of the Data Source Configuration Wizard, select the Database data source (Figure 11). After selecting “Next>” the following window will open (Figure 12). 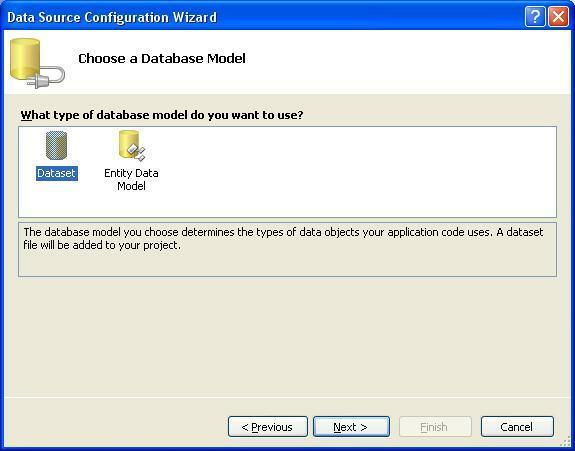 In this window you need to select the Dataset database model. 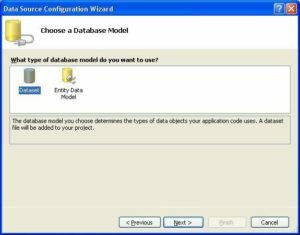 The selected database model determines the types of data objects that the application uses. This model will be added to our project. After selecting ‘Next>’ the following window will open (Figure 13). 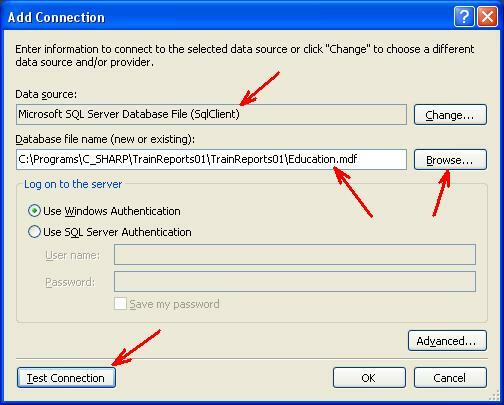 In this window, you must select the connection to the database to which the Education.mdf file corresponds. This connection corresponds to the string Connection String, which is automatically generated by the system. After selecting “Next>”, you must confirm copying the database file to the current project (Figure 14). As a result, the connection string is modified. 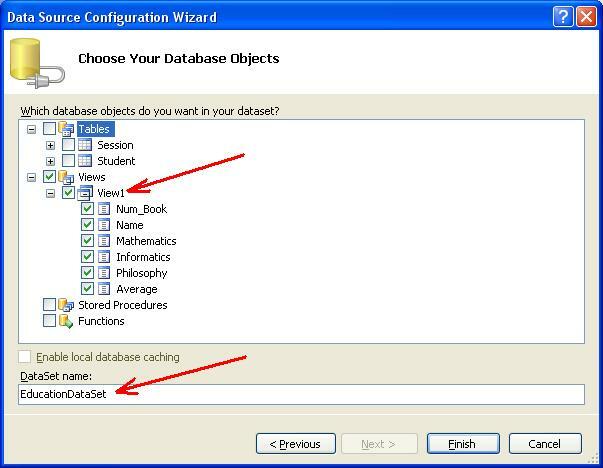 Since the Education.mdf database is already attached to the project (see step 3), it is recommended to select “No”. 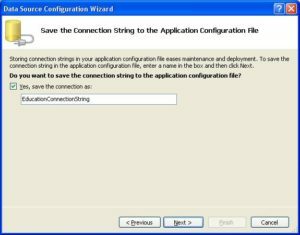 The next window (Figure 15) proposes store the Connection String in the application’s configuration file. It is necessary to leave everything unchanged and select “Next>”. 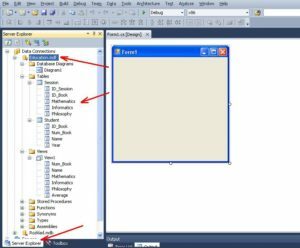 Next, there is a window for selecting database objects that will be included in the data set (Figure 16). 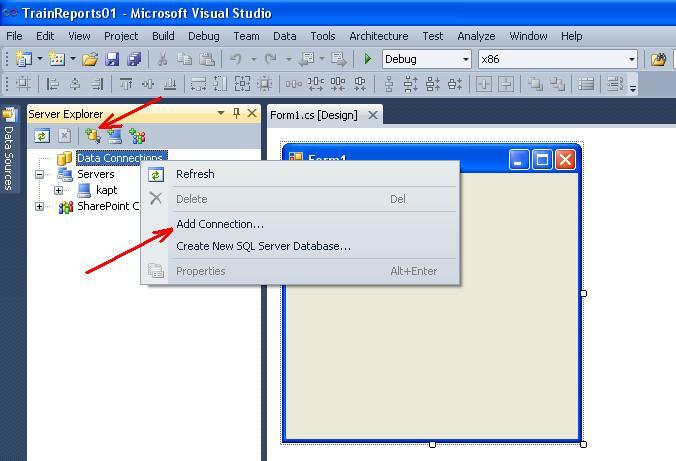 In our case, we need to select all elements of the view View1, which was generated by the Microsoft SQL Server DBMS. After selecting the “Finish” button, the previously opened Dataset Properties window with the created data set will be displayed (Figure 17). This window displays the View1 view fields that will be displayed in the report. It should be recalled that View1 was designed by Microsoft SQL Server DBMS. If desired, you can create one more (or more) data source using the “New …” button (see figure 17). 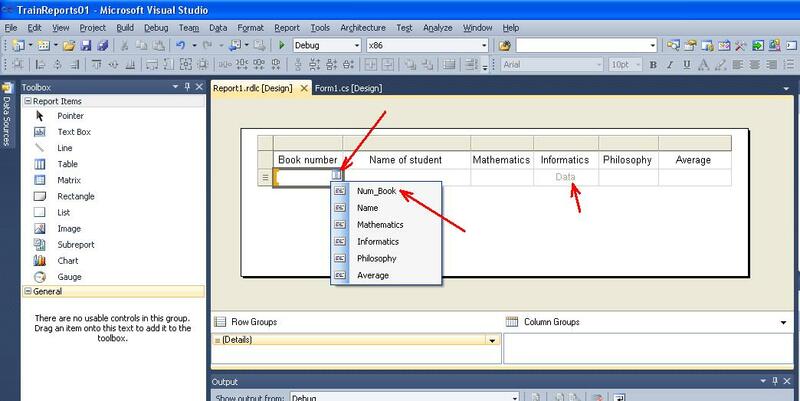 After confirming to OK, the Report1.rdlc report file window will have a view, as shown in Figure 18.
the Data area, that displays a set of data, which are displayed in each row of the table. A dataset is generated based on the View1 view. 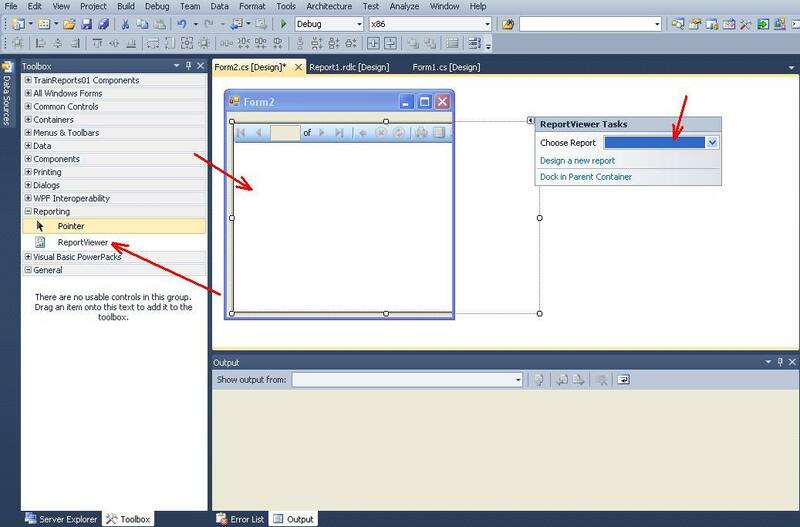 To customize the name of each column, double-click in the corresponding cell in the Header area, as shown in Figure 19.
execute the ‘Left’ or ‘Right’ command of the ‘Insert Column’ menu (Figure 20). 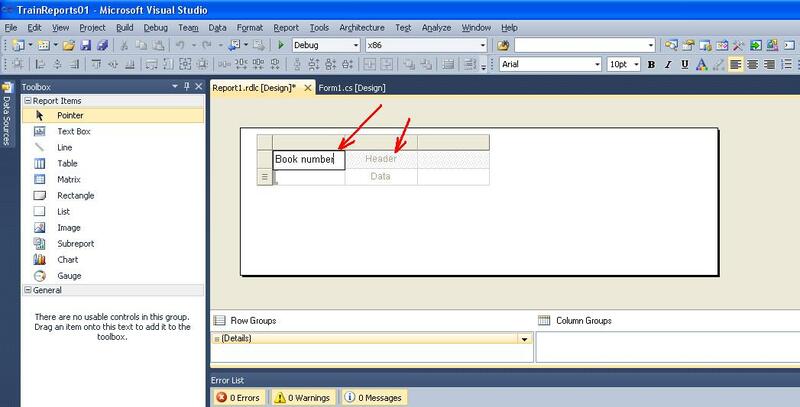 To place the title of the table header in the center, use the TextAlign property (see Figure 21) of the TextBox13 object that was created for the first column of the table named “Book number”. Also, you can adjust the width of each column of the table. 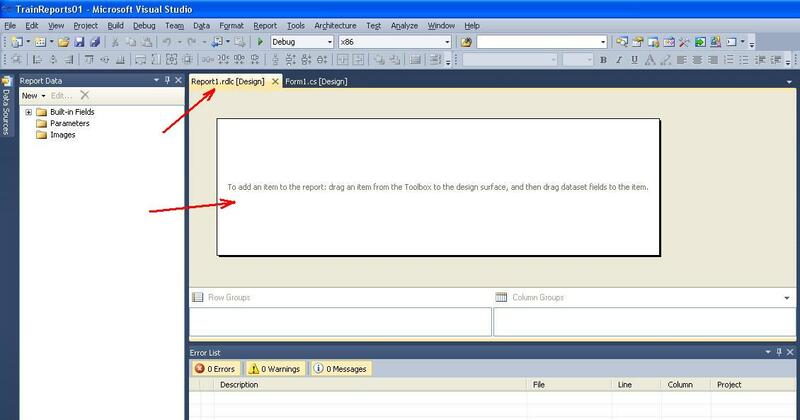 After setting all the headers, the window of the report file will have the form, as shown in Figure 22. At this stage, you need to configure the data that will be displayed in the rows of the table. The number of rows that will be displayed can be anything. 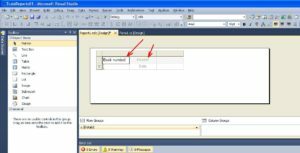 The data is displayed in the Data area of the table. Each column of the table is individually configured. The first column in the View1 view is a column named Num_Book. This column should be selected in the context menu of the table as shown in Figure 23. The corresponding View1 view fields are selected in all subsequent columns. After the formation of all the columns, the table will has view as shown in Figure 24. To set the report header, use the TextBox tool (see Figure 25), which you need to place above the table. After placement, the corresponding object will be created. To specify a name, you need to click in the rectangular area of the TextBox tool. If desired, you can improve (change) the type of the report with the help of other tools. In accordance with the condition of the task, when clicking on the “Show Report” button, a new form of application can be opened with the created report. Therefore, in the program need to develop a new form. 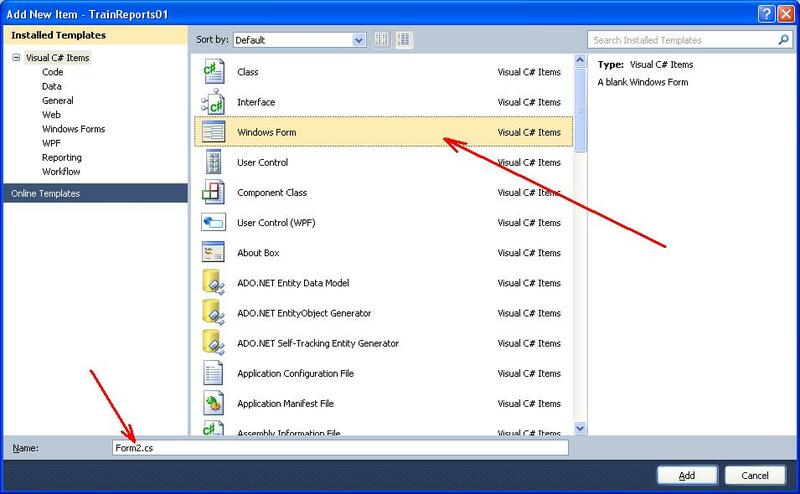 As a result, the “Add New Item” window opens, in which you select the Windows Form template and leave the name of the Form2.cs file offered by the system. As a result, Microsoft Visual Studio will create a new form, which, so far, does not have any controls. Class, named Form2 corresponds to the form. 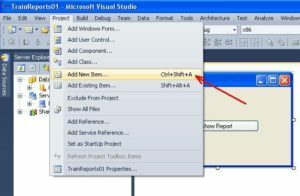 In order for the report to be displayed in the application, the “Report Viewer” control is provided in the Microsoft Visual Studio (see Figure 27). 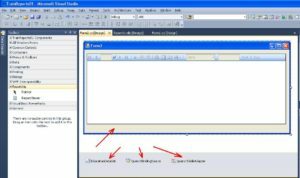 This control connects the application (program) with the report file Report1.rdlc. First, go to the form design mode “Form2.cs [Design]”. Next, from the ToolBox toolbox on the Reporting tab, select the ReportViewer control and place it on the Form2 form with the mouse, as shown in Figure 27. 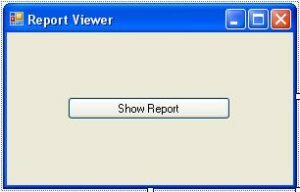 As a result, the system will automatically prompt you to select a report file in the ReportViewer Tasks window (see Figure 27). 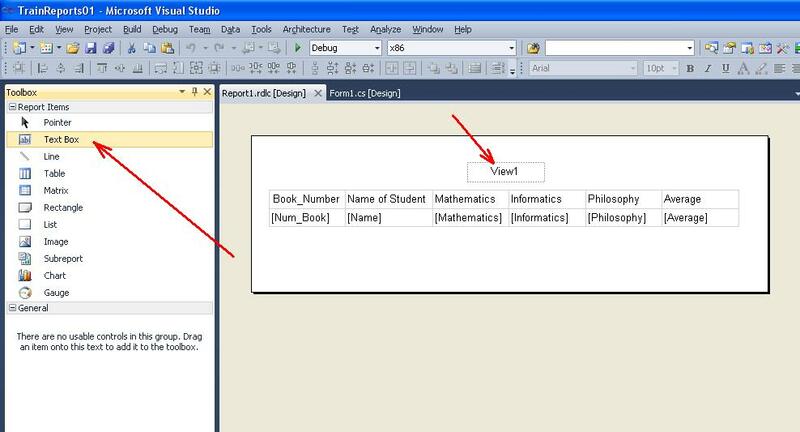 In addition, an instance (object) named reportViewer1 will be generated for the control. 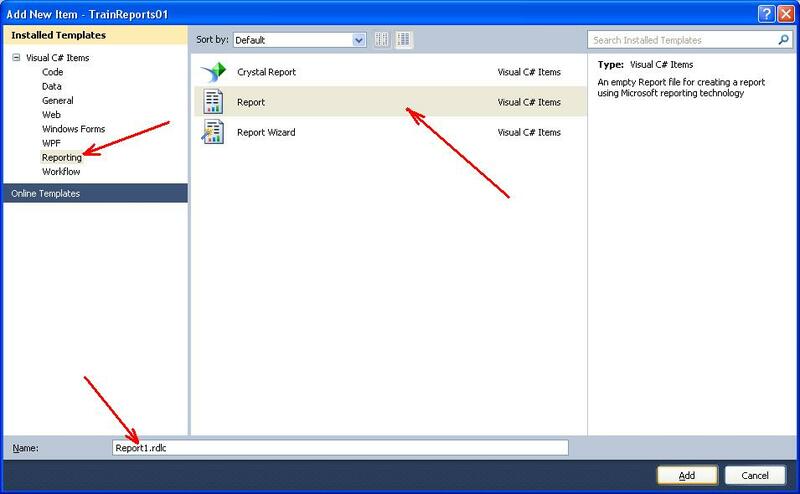 After selecting the drop-down button, the Report Viewer Tasks window displays a list of the connected (created) report files. In our case, you need to select one file named TrainReports1.Report1.rdlc (Figure 28). Here the prefix TrainReports1 stands for the name of our project. After selecting the Report1.rdlc file, adjusting the size of the Form2 form, and adjusting the size of the reportViewer1, the form window will appear as shown in Figure 29. 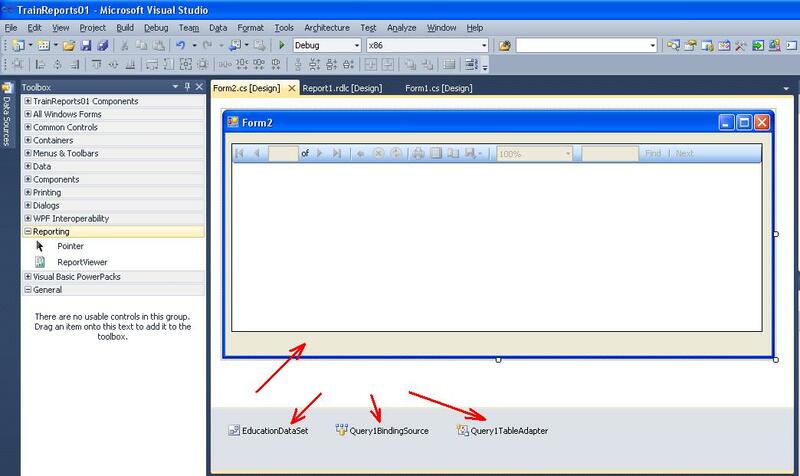 The system automatically generates three objects named EducationDataSet, Query1BindingSource and Query1TableAdapter. 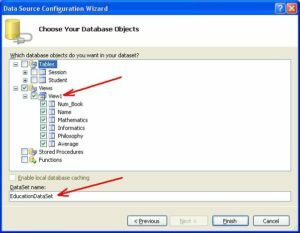 These objects connect the application to the database. They can be used to programmatically manage the report. But this is a completely different topic. 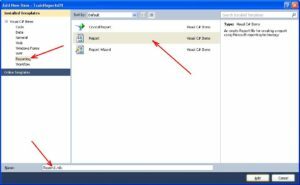 To verify that the Report1.rdlc file associated with reportViewer1, it is needed to click on the arrow in the right corner. After setting up reportViewer1, the system will automatically generate the report display code on the form in the Form2 event’s Load event handler. The Load event of the Form2 form is called at the moment if you want to display the form on the screen. Therefore, calling Form2 from the main form (Form1) will automatically display the report. As you can see from the listing, an instance of Form2 is created in a standard way and a form is called on which the report will be displayed. 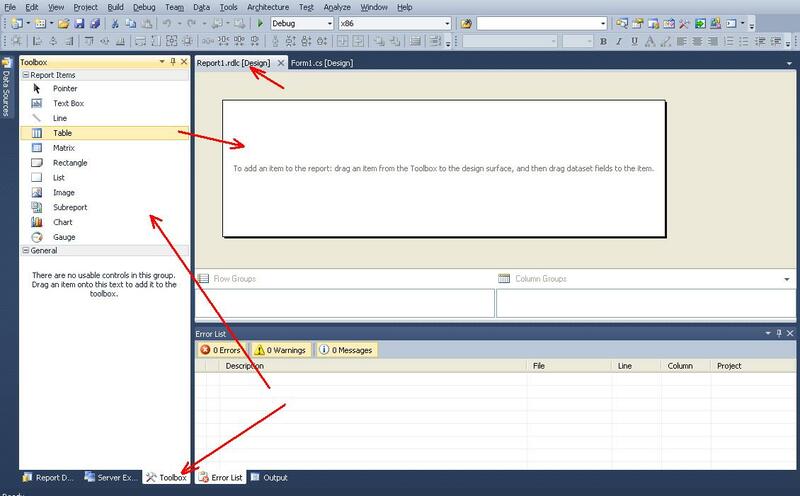 After running the application for execution, the program window, where the report is displayed, will appear (Figure 31).